Vídeo de viaje de Extremadura e información sobre Extremadura. Consulta nuestro vídeo de información de vacaciones en HD sobre Extremadura. 10 mins outside berzocana walking, quiet little town you need to know what time shops are open. Extremadura is a land of contrasts, of UNESCO heritage sites, natural beauty and spectacular landscapes, and a rich gastronomy influence. The inland region is nestled amongst the regions of Andalusia, Huelva and Castile La Mancha, and sits on border with Portugal. As you can imagine it has an interesting combination of influences from each of its neighbours. Extremadura is an excellent destination for those looking to discover a region, relatively untouched by foreign tourism, outdoor pursuits activists and explorers of cultural and historical Spain. Badajoz airport is Extremadura’s only airport, but it isn’t accessible from outside of Spain, so visitors should catch a flight to Madrid-Barajas Airport and from there hire a car, or take a coach. Alternatively if you travelling to the south of the province, you can take a flight to Seville or even Lisbon, crossing over the border into Spain. It’s definitely one for the more adventurous and flexible traveller, but it’s a great excuse to visit other areas of Spain and Portugal. Extremadura is split into two provinces, those of Badajoz and Caceres, both are cities, but the capital of the region is Merida. Merida is one Extremadura’s UNESCO heritage sites. It is the location for some of the most exceptional Roman ruins in Europe, including a gargantuan theatre, an amphitheatre, two aqueducts and a bridge. In the city you will also find the Museum of Roman Art, which is a recommended visit. Running along and away from the banks of the River Guardiana, the city stretches out. There is a also an Arabic influence in Merida, the Alcazaba is located down river, accessed via the Roman bridge nonetheless! Merida has undergone a rejuvenation in the last years and makes for a culturally interesting and leisure enjoyable visit. There is a Classical Theatre festival held during the summer, if you can cope with the interior heat. Badajoz is both the capital and the southern-most province of Extremadura. It attracts more tourism from Portugal as it is closest to the border and is also the site of the only airport in the region. In Badajoz you will find a rich combination of Moorish and Jewish architecture, and if you want to explore further the historical heritage of the region, you can follow the Mudejar route. Caceres is the second UNESCO heritage site of Extremadura. It’s history spans back to 34BC when it was founded by the Romans; yet its great era came with the Moors during the 12th century. It has one of the most complete medieval quarters in Spain. Picturesque cobbled streets with Moorish buildings, watch towers, Renaissance palaces and buttress buildings make up the old quarter of Caceres. It’s a must for tourists looking to immerse themselves in ancient Spanish culture. From Caceres visitors can also set out on the Via de la Plata (Silver Route); an old Roman road that was used by pilgrims heading to Santiago de Compostela. Other historic towns include Trujillo, with its stunning main square, Guadalupe, the third UNESCO heritage site of Extremadura and home to a stunning Mudejar monastery. Zafra is a delightful town, nicknamed Sevilla La Chica (Little Seville), for its close resemblance to the Andalusian capital. If you are looking for a rural location with lots of outdoor pursuits on hand, then we highly recommend Extremadura. The region has some spectacular natural landscapes and is abundant with flora, fauna and wildlife. The Tajo International Natural Park is situated on the border of Extremadura with Portugal and cross the border between the two countries. It is an area of extreme natural beauty, the River Tajo runs through it and visitors can take a river boat trip passing through uninhabited territories. There are over 1000 kilometres of trail routes through the park for trekking and walking enthusiasts. Monfrague National Park is biosphere reserve with the largest and best preserved Mediterranean forest in existence. Again there are various walking routes, which take you along scenic landscapes of oak forests, meadows, rivers and reservoirs. If you are into bird watching then you are in for a treat in Extremadura, as it is one of the best places in Spain to watch birds in their natural habitat. There is a great diversity of bird species, including some endangered species. Spring is the ideal time for a bird watching trip. Spain is famous for it’s Jamon (Cured Ham) and the meadow lands of Extremadura produce one of the greatest Iberian cured hams. The Torta del Casar Cheese is said to be Spain’s best sheep’s milk cheese, which is produced in the town of Casar de Caceres. The cheese has a hind rind but is soft and creamy when cut open – delicious! 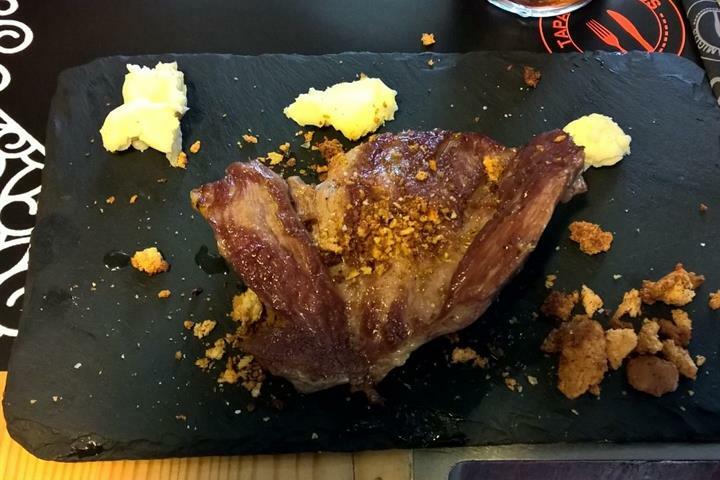 Olive oil, beef, pheasant, partridge also form part of Extremadura’s main locally produced gastronomy elements. Extremadura enjoys a typical Mediterranean climate, with mild winters and warm summers. The south of the region is warmer, with temperatures dropping to the north and in the higher altitude areas, such as the Sierra Morena, where there is often snowfall during the winter. Qué ver en Badajoz en 24 horas. Descubre los encantos de su centro histórico, que no son pocos (¡y son todos gratuitos!). Si planeas viajar a Mérida no te pierdas esta breve guía para descubrir en dos días los lugares imprescindibles que debes visitar. En este artículo te invito a recorrer el centro histórico de Cáceres a través de una visita a los lugares más emblemáticos en orden cronológico. Si planeas tu primera escapada a Extremadura y eres de los que disfrutan probando platos típicos cuando viaja, este artículo te va a venir muy bien. Recorre Extremadura de norte a sur en este itinerario visitando los destinos gastronómicos más señalados. Los valles, ríos, pantanos, montañas, dehesa y paisajes interminables de Extremadura ofrecen innumerables posibilidades para escapadas rurales.